Home > Cats > What are Barn Cats? Everyone knows that cats are natural predators and given the opportunity many cats will hunt and catch birds and small mammals. In the past this was an important skill and cats were often kept because they are hunters and able to keep houses and homes free from rodents and other pests. As time has gone on, however, households have introduced other ways of controlling pests and the majority of houses in the UK are free of rodents. As this change has taken place, cats are kept primarily as pets as their hunting prowess is no longer required. There is a type of cat that falls between the domestic cat as it is known today and a feral cat. This is the barn cat. Barn cats are cats who live most of their time outside. They will be fed by their owners, however will rarely come in the house and will certainly be unlikely to be lap cats. A barn cat will supplement the food that he is fed with food that he catches such as mice, rats and other small mammals. Barn cats are very independent and will require little from their owner other than somewhere safe and warm to sleep and some food. Why Adopt a Barn Cat? Barn cats are not for everyone. For families looking for a pet cat that will enjoy being petted and cuddled and becoming a constant companion, then a barn cat would be far from suitable. For families living in a rural situation with outbuildings and land then a barn cat might be ideal. Adopting a barn cat is one way of keeping rodents under control and many people prefer this to putting down dangerous poisons. Some barn cats do become affectionate towards their owners and might eventually start coming indoors to sleep and gradually becoming a member of the family. Other barn cats remain firmly independent and will rarely show any affection to their owners. Neutering – it is just as important to neuter barn cats as it is house cats. A single female cat can have many litters of kittens over her life and unwanted kittens are a drain on animal welfare organisations and rescue centres. Vaccinations and parasite treatments – a barn cat will be spending a lot of his time outside and eating mice and rats. As such it is important that he is kept up to date with his vaccinations and regularly wormed and treated for fleas. Vet bills – barn cats may become injured or ill and as such it is important to consider potential vet bills. 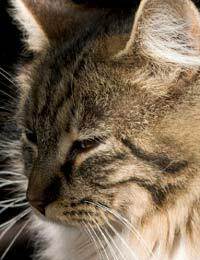 As barn cats are hunters they may well experience injuries from rats or other prey. Close attention should be given to any scratches to make sure that they do not become infected. Many rescue centres have barn cats looking for homes and for the right rural household they can be perfect!